← Nine weeks to go until the ILT2014 Conference | Session Selections opening next week! Session Selections are now open ILT2014 Conference | Lock in your personalised program! Today we officially hit the "50 days to go" until the Inclusive Learning Technologies Conference 2014 (ILT2014) kicks off on 20th May on Queensland's Gold Coast! If you have registered already, this update is just keeping you in the loop. AND you should have received an email last Friday, advising you of how to go in and select the sessions you wish to attend! Giving you the first choice of options on all of the presentations. If you didn't receive this email, maybe quickly check your Junk Mail folder. If you still have a problem finding it, just email us on conference@spectronicsinoz.com or ring the Spectronics office in Brisbane on (07) 3808 6833, or +61 7 3808 6833 if you are calling from outside Australia, and the conference team will be happy to help you out. If you haven't yet registered, Session Selections are now open to you and, at the moment, there are still places left in all presentations! Of course, the sooner you register, the better your chances will be of locking in ALL of your preferred sessions. NO MORE WAITING! Session Selections are now open for you to lock in your personal ILT2014 Conference program! Yes! Session Selections are now open. How do you go about choosing your own personalised program? It's simple. As soon as you complete your registration, you will be sent an email with instructions and your own individual password. You will be pointed to an online page to make your choices. You will be able to revisit that page at any time up until the Thursday before the conference (Thursday 15th May 2014). Please note that this is optional. Well, I'll clarify that one. If you are attending one or more of the Pre-Conference workshops, we definitely need you to nominate which one you are attending. So that we make sure we allocate rooms big enough to accommodate everyone wishing to attend each Pre-Conference workshop. But … if you don't want to pre-select and just wish to "wing it" onsite for the other three conference days, that will be fine. If there is a session that you have on your "must attend" list though, you might want to take this advance offer opportunity to lock your place in now. You also do not have to make a selection in every time slot, you can lock in your place for all of them or just for the one or two you really want to be a part of. Please note that no session selection changes will be possible onsite at the conference. Of course, you can change your mind about your preferred sessions while at the conference – as many people do once they have enjoyed a particular presenter and wish to learn more from them – but we are not able to make changes for you. If there is room in the session after all delegates who have booked a place are in the room, you will be more than welcome to join the session. But some will be booked out and only those who have selected the session will be able to attend those presentations. How to see your session selections within the ILT2014 Conference app? First up … did you know there was an ILT2014 Conference app? Learn more about it here and how to download it from the App Store on iTunes or from the Android Market. Once onsite at the conference, it will become your go-to-tool for keeping track of the sessions you are attending, the ones you've “bookmarked” that you’d like to get to but can't fit into your schedule, along with organising your social schedule and informal networking onsite! The cool thing with the app is that the My Schedule section of the app literally “talks to” the Session Selections page on the ILT2014 Conference website! Provided that you are using the same email address to login to both the Session Selection page, and into the ILT2014 Conference app, your personalised program will automatically appear in the My Schedule section of the app! It takes a little while to populate initially, but after that time, any changes you make online, will be transferred over to the app. Cool! Why don’t we just use the app for you to create your personal schedule? We really needed a central online place for all selections from all delegates to be securely stored. That way we know how big the room needs to be to accommodate as many as is possible of the delegates wanting to attend each session. And our “door people” at the conference will know who has pre-booked for a session, making sure there will be a seat for you when you arrive at that presentation. All program and presenter details are available on the Conference Program page of the conference website. But if you are one of the many people telling us that they find it handy to have a printed copy of the full conference program on hand, we also offer two downloadable PDF options for you. 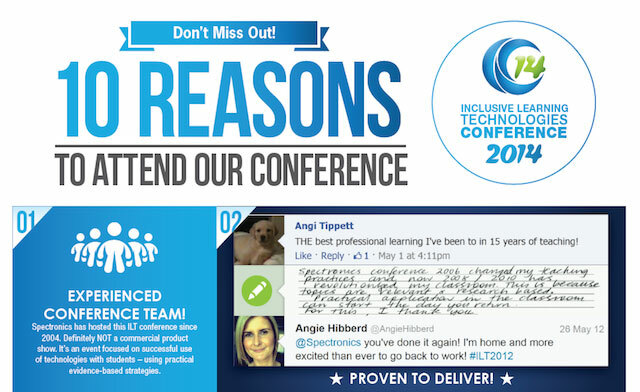 WIN an AbleNet iPad Accessibility Bundle at the Conference Closing Session | Valued at $4000! AbleNet has once again generously stepped up to become one of our highly valued Gold Sponsors for the 2014 conference. This year’s AbleNet bundle is made up of the top-of-the-range iPad Air and a selection of new technologies that make the iPad accessible to switch users. 1 x Jelly Beamer Twist Wireless Switch and 1 x Mini Beamer Wireless Switch Package to take advantage of the wireless receiver built into the new Connect case for iPad! What do you have to do to win this prize? All you need to do is tell us tell us about your situation and how you would benefit from winning the AbleNet iPad Accessibility Bundle. And make sure we have your entries in hand on or before Wednesday 21st May. Just complete the form online entry form or download the PDF version of the entry form. Good luck! Winning the AbleNet Competition Bundle Would be Amazing for us! At "ILT2014 Conference Central", we were very excited to hear that the Briars Special Early Learning Centre team would be sending EIGHT of their staff to join us at the conference again. Travelling all the way from South Australia. They were the winners of the AbleNet prize at the ILT2012 Conference and have come back to present the story of their assistive tech journey since then in their session titled "Winning the AbleNet Competition Bundle would be Amazing for us!" We are in awe of the effort they have gone through to join us, as shared in the following inspiring message received recently from Judith Candy, Director of the Briars Centre. "Here is the list of people coming to the conference. Thank you very much for organising our registrations. We are really looking forward to the conference and everyone is poring over the program to see what suits who the best. This is a very big commitment for us with flights and accommodation and to finance the conference we have been doing lots of fundraising. We have held our own one day conference “AAC and Assistive Technology: Empowering children and young people to be actively involved in their world”. This was opened by the Governor of SA and was very well attended. We have also held sausage sizzles and held a quiz night. We are using the money to buy our AAC and IT resources too. As we have some people presenting at the conference, we are adding up the total cost of the registrations, taking away the money we have raised and splitting the cost evenly between us. What a team! It is truly worth the effort. The impact of the last conference on our site has been invaluable!" We agree with Judith. What a team! There are so many conferences and workshops available. What makes this one so special? Why should you choose to commit your limited funds to joining us? Click here to download the PDF flyer outlining the TOP TEN REASONS TO CHOOSE OUR CONFERENCE! But … if we had to identify just the TOP TWO reasons that separate us from the conference pack, first up it would be the fact that we offer a unique professional development opportunity focused exclusively on learning support and technology. A combination not available anywhere else in the Australasian/SE Asian conference calendar. Some focus on technology. 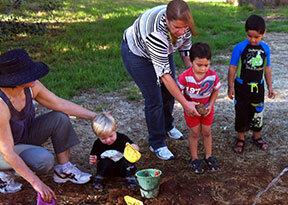 Some focus on learning support or special ed intervention strategies. We cover both. In every session! AND secondly, we make it VERY easy for you, or your team members attending the conference, to share what they have learned on their return home. Maximising the benefit of your investment in the conference. All of the conference presentation materials and supporting resources will be available online to be shared freely for TWELVE MONTHS after the conference is complete. An optional “Virtual Registration” also provides access to an additional 40 hours of video recordings from the conference for twelve months too. Great for a full year of staff development presentations and IT strategy planning on return-to-base! We'd love to have you join us if you have not already registered. Just sing out if you have any questions at all on email conference@spectronicsinoz.com or phone (07) 3808 6833 at our Brisbane office. You'll need to call +61 7 3808 6833 if calling us from outside Australia. PS Don't forget that entries are now open for the awesome Texthelp Literacy Bundle Competition – giving you the chance to win a Chromebook, software and Google Extension bundle valued at $11,669! To be in the running to win, simply submit your entry online here or download the PDF version of the competition entry form. Remember that entries close the week before the conference on Wednesday 21st May.